Blackjack Trainer was created to teach people who are relatively new to the game all of the rules and strategies that today's best players use. Blackjack Trainer gives the player the control to learn and manipulate several factors so that they understand every aspect of Blackjack. For those who want to jump right in, they can simply click "deal" and a game will start. From that point, if you decide that you want to adjust the game, simply go to the "options" tab and you are free to change what you please. This means that you don't have to restart a game every time you feel that you may have bitten off more than you can chew. As you start to learn the basic rules to Blackjack, you can advance and hone your skills. Blackjack Trainer goes a step above teaching just the basic strategy, even showing you the advanced technique of counting cards. Counting cards is essential for a person who wants to play either professionally or to make a profit. Not only does counting cards make you a better player, it evens the odds between you and the dealer, giving you a higher probability of winning the game. There is a set of lessons that you can participate in if you would like. Of course, this is completely your option and you may take them in any order or skip them altogether. By simply spending about an hour a day, you will be able to finish the five week program and learn valuable information and skills. For the first week, turn on the "force basic" function. This allows you to learn the basic rules of Blackjack without having to worry about anything else. Once you are comfortable with that, turn on "warn basic" for the second week. This function will let you play freely, but warn you when you are about to make a critical mistake. This allows you the opportunity to play while still being safe. Once you feel confident to move on, turn off the assistance and try it out for yourself. For the fourth week, turn on the "track deck" and use it to learn how to bet properly. Turning this feature off will be the final step, completing the five week training course. Once you have finished it, you'll have a strong grasp as to how Blackjack works and what you can do to become a better player. Blackjack Trainer was built for beginners and skilled players alike. 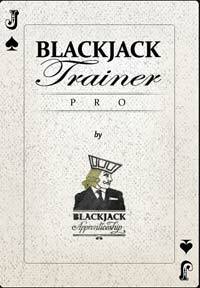 If you've always wanted to take your game to the next level, be sure to check out Blackjack Trainer. It may be the program you've been searching for all along.